Click for a large view of the chart. 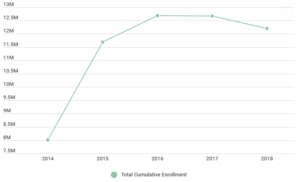 Early reports from the Centers for Medicaid & Medicare Services indicate 2019 enrollment in the federally facilitated marketplace (FFM) could be lower than 2018, which would continue a declining enrollment trend first seen in 2017, which prompts the question – why? As this chart shows, policies and investment in outreach and application assistance for consumers matter. The enrollment decline in 2018 coincided with federal cuts to Affordable Care Act (ACA) marketing and the navigator program, widespread confusion spurred by prolonged efforts to repeal and replace the ACA, and the repeal of the individual mandate, which goes into effect for the 2019 plan year. The elimination of the federal cost-sharing reduction funds for the lowest-income marketplace enrollees likely also had an impact on enrollment, despite states’ and health plans’ quick efforts to “silver load” premiums to help make up for the loss of the critical subsidy. Ongoing health care cost increases that affect premiums, particularly for consumers without subsidies, also affect enrollment. While states — especially those operating state-based marketplaces (SBMs) — are trying to mitigate individual market instability, the federal changes have had unmistakable impact. There is still time for enrollment to climb during this open enrollment period, as the FFM’s open enrollment period extends through Dec. 15, 2018, and a number of states operating SBMs have opted to extend their open enrollment period into January 2019. However, it is not yet clear how the expanded availability of short-term limited duration and association health plans, which provide less comprehensive coverage at a lower cost, will affect the 2019 open enrollment. The National Academy for State Health Policy will continue to track marketplace enrollment and will update the chart once the FFM and all SBM open enrollment periods have ended.